The AAUW-NYS Convention What’s in it for YOU? 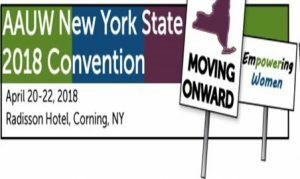 Still thinking about registering for the AAUW-NYS Convention? Here are some reasons to join with others from around the state at Moving Onward: Empowering Women! 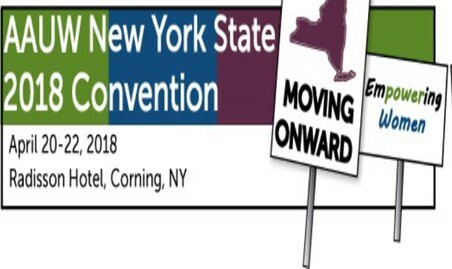 It will be held at the Radisson Hotel in Corning, NY on April 20-22. You’ll have a chance to……..
• Meet Aasha Shaik, an outstanding young woman who has already helped to shape a better world for women and families. She serves as the UN Girl Advocate and has talked with world leaders about ways to change conditions for women. • Participate in workshops focusing on both personal and professional growth. Learn to work with the local media, support women running for office, stretch both your body and your imagination, and become a more effective community advocate. Plan on being part of this event! The goal is to provide an educational, inspiring and fun convention weekend. It’s time to register – the deadline is March 23. Visit www.aauw-nys.org now! This entry was posted in AAUW NYS Convention, General and tagged AAUW, Empowering Women, General on February 28, 2018 by drrani.